I recently wanted to use a Mutating Admissions Controller in Kubernetes to alter pods submitted to the cluster – here is a quick summary of how to do it. In this case we wanted to change the image pull location, just as a quick example (I’m not sure this is a great idea in a real system as it introduces a single point of failure for pod creation but the sample code should be useful to others). So how do they work? Well it’s super simple, you register a webhook in K8s which is called when a certain action occurs and you create a receiver which accepts that webhook and responds with a JSONPatch containing any changes you want to make. Lets try it out, first up you’ll need ngrok, this creates a public endpoint for a port on your machine with an https cert and everything. We’ll use this for testing. Lets start our webhook receiver locally. The code is hopefully nice and simple to follow so take a look at it here. If you’d like a more complex example you can take a look at the golang code here in istio which uses a similar method to inject the istio sidecars (This is what I read in order to write the Typescript example). Note: ngrok approach won’t work in an Azure AKS cluster due to networking restrictions, you’ll need an ACE Engine cluster or other.. or you can test inside the cluster with the receive setup as a service but beware of circular references (pod can’t be created because CREATE calls webhook which is received by the pod which can’t be created). 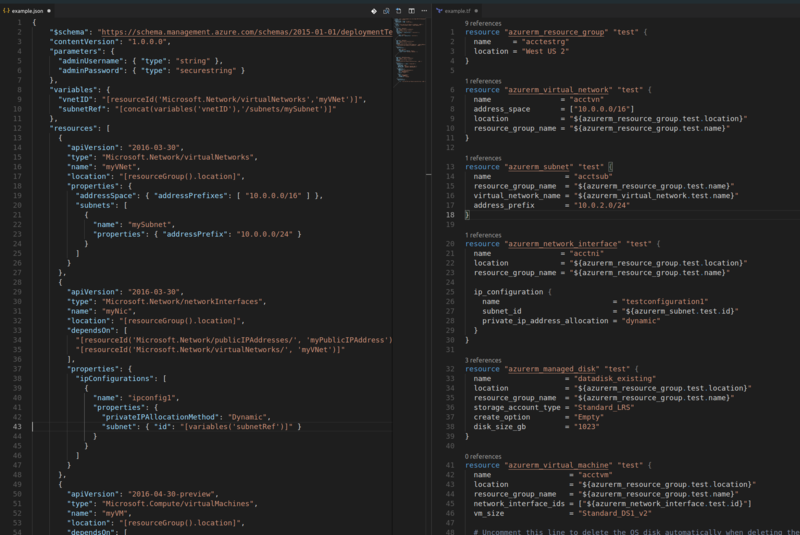 Let me give you some background: I’ve been a heavy user of the Azure Resource Manager (ARM) templates for some time now. We’ve had some good times together. We’ve also had some bad times and boy have we seriously fallen out at times! I’ve used ARM extensively to automate deployment, configuration and update of the infrastructure in Azure. I’ve used it on everything from single-person projects to large scale dual-region deployments of services with critical live traffic. The takeaway for me has been: ARM is solid, reliable and does what I need – however, it isn’t always the easiest to use and it forces a wall between infrastructure deployment and application configuration which I’ve always found to be painful. For example, when working with Azure Storage through ARM you can create a storage account, but you can’t create ‘queues’ or upload ‘blobs’ into the account. Another example – you can create an Azure Kubernetes cluster with AKS but you can’t create ‘secrets’ or ‘deployments’ in the cluster. Shortcomings like these can be painful at times, and difficult to work around. Deploy your container based application. Once ARM has finished, you want your application set and and ready to go. You don’t want the container to have to check and create queues if they don’t exist. You don’t want it to somehow retrieve the Redis access keys. My other issue with ARM is much more personal and many may disagree, but I find it very hard to author. VSCode has introduced some great ARM tooling which certainly helps make things better, I still find it dense and hard to parse mentally. Create a storage account with a random name, create a container called ‘scripts’ in it and upload ‘init.sh’ script into the container. Full example here generates a SAS url to the uploaded script. Terraform is run on your client, which means you can also do more; things that aren’t possible with ARM, such as uploading ‘blobs’ or configuring ‘queues’. But that’s not really the main thing that has me converted. Terraform is made up of ‘Providers’ which each know how to talk to a set of API’s. Think of these a bit like ‘Resource Providers’ in ARM. Terraform has an Azure provider but it also has a Kuberenetes provider, a CloudFlare provider, a RabbitMQ provider… you get the point. This is where things really light up. No modern solution of any serious scale is solely confined to one stack/cloud… with Terraform you can reach into all of these by including, or even writing your own, providers. The result is that you have one toolchain and one interface to work with. You can bridge between infrastructure and runtime, taking access keys and injecting them into your k8s cluster as a secret, for example. You can see an end-to-end example of this with an AKS cluster in my repo here. Good question. There are, as they’re always are, some downsides to Terraform. Firstly, not all of ARM APIs are provided. There is a nice workaround to this which lets you embed ARM within Terraform which goes a long way to mitigate this issue. You can see an example of that here where I call Azure Batch from Terraform. Some of the docs and examples of Azure are out-of-date or need some tweaking too. But, it’s an OSS effort so you can (and I have) add functionality for resources that are missing and fix up docs as you go. Secondly, like any abstraction there are leaks occasionally and where you gain those abstractions it will, ultimately, bite or nip or maybe it won’t, but this depends on what you’re doing and how you’re doing it. For me this hasn’t been a problem…yet. What else is in this space? https://pulumi.io/ also just launched which has an interesting take on the deployment/configuration problem but I haven’t yet had a chance to play with it in detail. Big thanks to @martinpeck for helping with this post!